Durite assorted heavy-duty uninsulated copper tube terminals in a sectionalised plastic box. 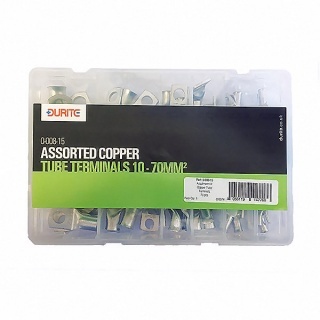 Assortment box of the most common tinned copper cable crimping terminals, suitable for cables 10-70mm². Supplied in a handy sectionalised plastic box. Pack quantity: Approximately 78 pieces. Comprises: 0-008-22 x 8, 0-008-23 x 8 0-008-32 x 8, 0-008-33 x 8,0-008-32 x 8, 0-008-43 x 5, 0-008-44 x 5, 0-008-53 x 5, 0-008-54 x 5, 0-008-63 x 5, 0-008-64 x 5, 0-008-74 x 4 and 0-008-75 x 4. 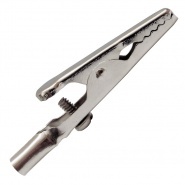 Pack of 50, 5A crocodile or alligator clips, nickel plated steel, 44mm long, jaw opening 13mm, Ministry: 5940.99.940.0856. 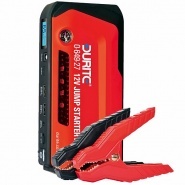 Portable 12V jump starter with 12,000mAH Li-ion battery. Highly portable, small and compact with a self-contained battery booster. 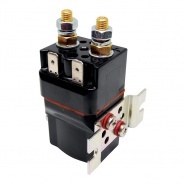 Albright SW60-38P 12V continuous contactor, designed for a compact DC application, used as a line switch on electric vehicles.